Crème fraiche originated in the Normandy region of France, from the town of Isigny-sur-Mer. It is an aromatic mild cultured cream product, traditionally with a fat content of around 30-40%. 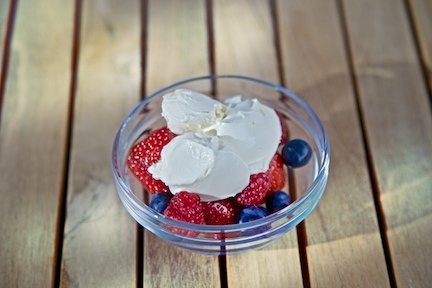 Crème fraiche is a versatile product which can be used in both sweet and savoury dishes. For use in desserts, it requires a clean, mild cultured flavour that doesn’t overpower other ingredients. Producers look to achieve a texture which is smooth, creamy and spoonable. KaTech has a proven track record in assisting food manufacturers to looking to develop new creme fraiche products. Crème fraiche requires heat stability, otherwise the milk proteins in the cream will curdle, giving a course mouthfeel and appearance. Traditional high fat products rely on the fat content to protect the proteins during heating. However, the development of half fat versions of crème fraiche (15% fat) and low fat versions (3% fat) have presented food manufacturers with a number of challenges. Reduced fat products are not as heat stable. Our approach is based on adding suitable ‘clean label’ ingredients to enhance protein stability, ensuring the product doesn’t curdle when added to hot liquids, and rebuilding the creaminess and texture lost by the reduced fat content. If you are looking to develop a new product, please get in touch. If you are having issues with products, please get in touch, we would be glad to help. At KaTech we can help food manufacturers keep costs down when it comes to crème fraiche production. Cream is expensive, so clearly lower fat recipes, using optimum ‘clean label’ ingredients to replace the functionality of the fat, will result in a lower recipe cost. Milk protein is also expensive and contributes to the potential for heat stability issues during cooking. We can work with you to reduce milk protein content, replacing it with an appropriate ‘clean label’ ingredient system. This has benefits both from a product quality and cost point of view. Get in touch today to see how we can help you save costs.